Brewed by Roman for Difcom. 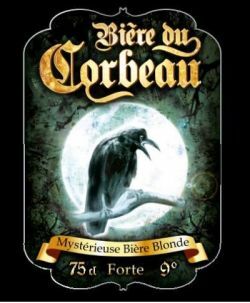 Mystérieuse bière blonde, la bière du corbeau fut il y a plusieurs decennies d’une des plus fameuses bières spéciales du marché. Bernard Provoyeur a remis cette bière au gout du jour. UPDATED: DEC 14, 2018 330ml Flasche. Trüb und blond mit kleiner Schaumkrone. Würzig. Etwas Malz und Bananenaroms. Süßlich im Antrunk. Für den Alkoholgehalt eher leichter Körper. 75cl fles. Helder goudgeel kleur, fijne romige witte schuimkraag. De geur is mout en licht kruidig. Smaak is zoet, honing, koriander en mout. Medium lichaam, veel koolzuur. UPDATED: OCT 12, 2018 Intense yeasty aroma with some oder of fruit. Taste is that of a rather complex Blonde, grain, yeast, fruit. Creamy texture. Intense, der very smooth given its strength. Pretty good. Sept 2018. 330ml bottle, unfiltered, from Leclerc, Saint Cyr, during the Paris-Versailles weekend. This has the plastic and perfume of a strong pale beer - be it a strong pale ale or strong Euro lager; but it also has some fruit which makes it a tad more interesting. I like strong malt forward beers - though straight pale malt versions tend to be a little boring compared to those using more interestingly roasted malts - so I'm OK with this. If the malt were more interesting I would rate it higher. 33cl bottle at home. Appearance: slightly hazy golden with medium sized white head. Aroma: belgian yeast, some stonefruits, malty. Taste: above medium sweetness and medium bitterness. Notes of malts, belgian yeast, some citrus and stonefruits. Palate: medium bodied, oily texture and lively carbonation. Slightly dry in the finish. Overall: pretty nice. Different from the majority of small brewery belgian strong ales. Flesje gedronken tijdens vakantie in Frankrijk. Goudgeel licht troebel bier, heftig schuimend tijdens inschenken. Aroma van gist en mout. Smaak is moutig en hoppig; bitter zelfs. In de nasmaak blijft de bittere smaak over. Bouteille 75 cl achetée chez Leclerc à Lille. A l’œil, rappelle une Duvel, blonde sans grand intérêt. Blonde forte, à la présence de l'alcool marquée, un peu métallique, pas ma tasse de thé. Côté sucré mais sans être agréable. J'ai l'impression de boire une bière que l'on consomme plutôt pour son degré d'alcool que par plaisir. Pour résumer : pas bonne. 75 cl. bottle. A hazy golden coloured beer with a white head. Aroma and flavour of malt, yeast, spice, fruit, hops, alcohol and with a sweet finish. Bottled. A golden beer with a huge white head. The aroma has notes of fruit, yeast, straw, and malt. The flavor is sweet with notes of malt, yeast, fruit, alcohol, and straw, leading to a dry finish.